I began with an open canvas: a 3300 square foot warehouse space -- a converted factory loft in the Southern Dairies complex on North Avenue in the Old 4th Ward. 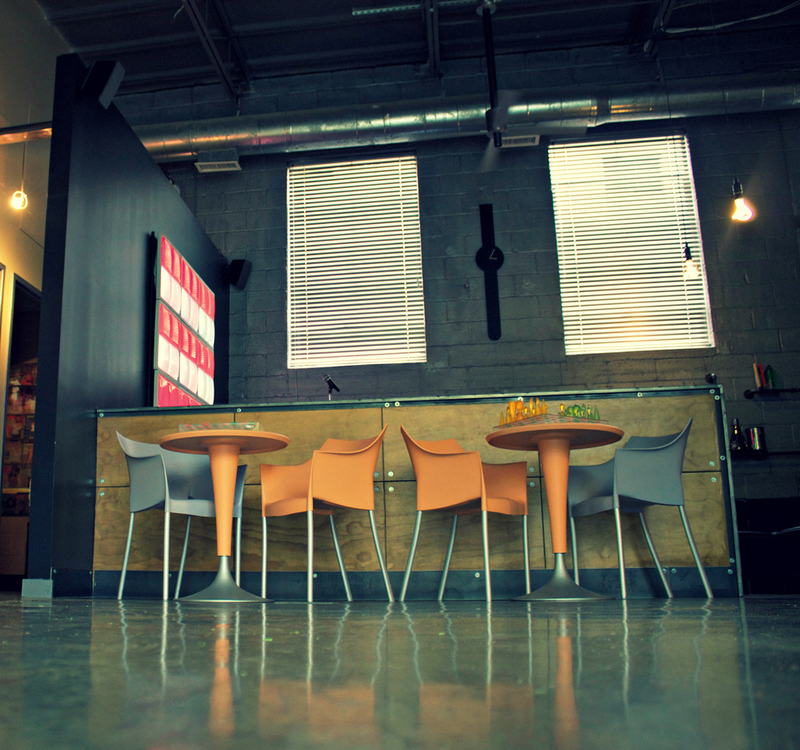 I designed the build-out myself, envisioning a space that draws one in to explore and discover. A space that -- just like my patients -- slowly reveals much more than initially meets the eye. Down the hall is the 2nd waiting space, a 1950’s retro diner, featuring a Zodiac burgundy V-back booth and a red glacier boomerang Formica table. 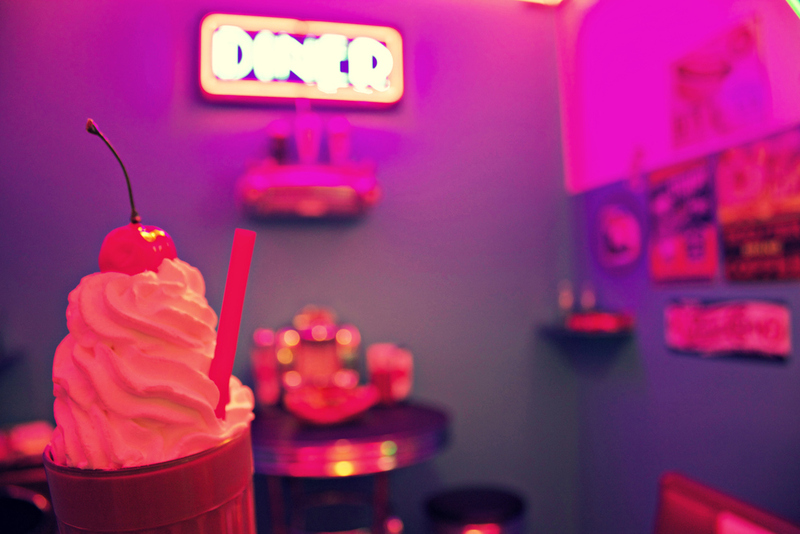 The ceiling and walls are covered in retro signage and neon lighting; a tabletop juke box and kit-kat clock add to the ambiance of pure 1950’s kitch. The third waiting space surrounds a 12-foot stage. It’s back-lit by 9 music-responsive LED panels, and features a working microphone and industrial stool. The couches are low and deep, with steampunk-inspired bookshelves built from industrial pipe fittings surrounding the perimeter of the performance space. Bare edison bulbs suspend from the loft ceiling. The shelves are filled with eclectic, irreverent reads -- most mined from the bowels of Urban Outfitters. The stage space beckons for karaoke, stand-up comedy, interpretive dance. There's something about a microphone on a stage that draws us out of our shells, irrespective of age. 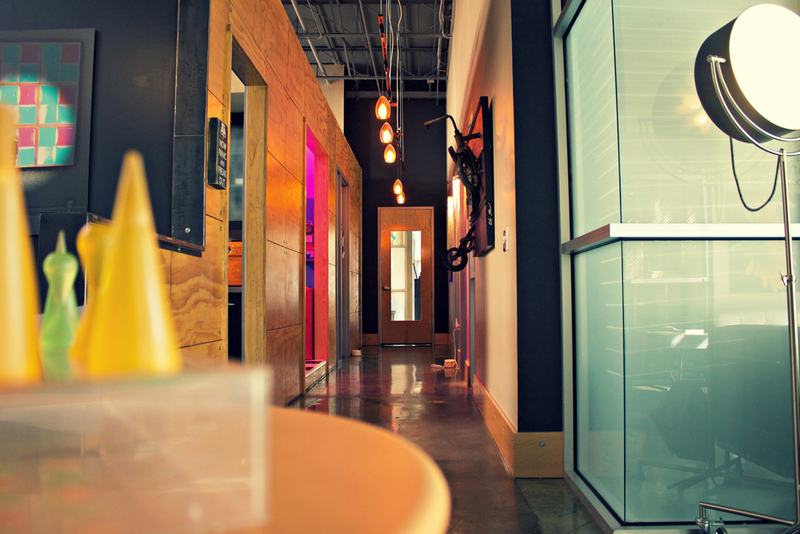 I envisioned a space that did not in any way feel like a sterile, clinical office. If I intended to challenge my patients to think differently about their difficulties, it seemed logical that I design an environment that challenged all pre-conceptions about what going to the doctor should feel like. When you enter my office for the first time, you're immediately forced to re-think where you are. “Am I in the right place?” is a question we should all ask ourselves regularly. Each office I created has it’s own unique aesthetic, one that ideally communicates a feeling of warmth, humor, simplicity, unconventionalism, and surprise. 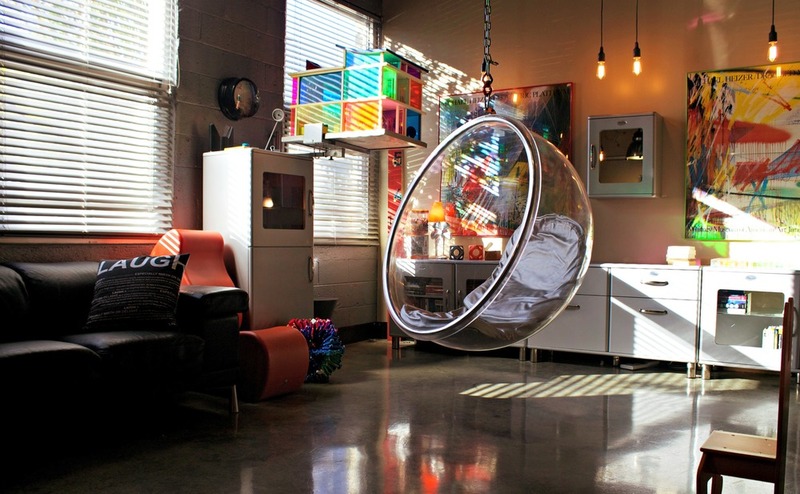 My office features a large bubble chair, suspended from the 16 foot ceiling. It’s a remarkable sensory tool that allows kids to swing while they speak. I’m often amazed by what even the most extreme ADHD kids can cognitively access in therapy when they are allowed to move while they engage. Splashes of bright colors fill the space, with a neon-paneled modernist doll house cantilevered from the wall and a wall clock-turned-aquarium that houses a bright red beta fish. A hidden missile launcher shoots foam projectiles at parents who complain excessively about their kids’ messy rooms. 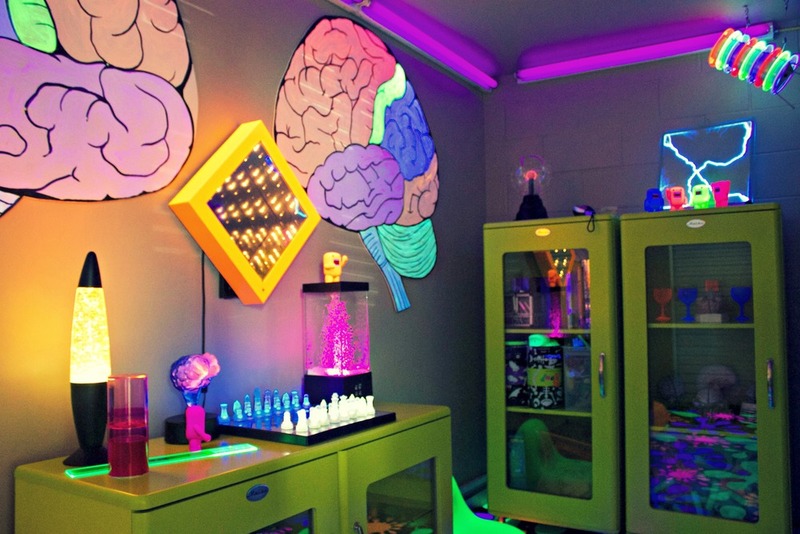 A sliding wall panel hides the entrance to a black-light playroom featuring lava lamps, plasma spheres, brain models, and toys that fluoresce in day-glo colors. People ask why a doctor that treats ADD kids has an office so filled with distractions? I usually smile and explain that Attention Deficit is a misnomer -- these kids do not have a deficit of attention; they are hyper-attentive -- attending to everything in their sensory environment as they navigate life. What’s more wonderful than coming someplace where -- with every visit -- you discover something new? On some level, that’s really what therapy is about.